Brink; illustrations by Marguerite Davis. — 1st Aladdin ed. Originally published: New York, NY: Macmillan, 1939.
and her six siblings living on the Wisconsin frontier in the 1860s. Fiction. 3. Wisconsin—Fiction.] I. Davis, Marguerite, ill. II. Title. , who was the original Caddie Wood-lawn, died in January, 1940. In a few more weeks she would have been eighty-six years of age. On the day she died she had made doughnuts in the morning, and repaired a lock on one of the house doors which nobody else in the house knew how to mend. That was typical of her full and useful life. The other answer lies in the letters which I have received from boys and girls asking for more Caddie Woodlawn stories. 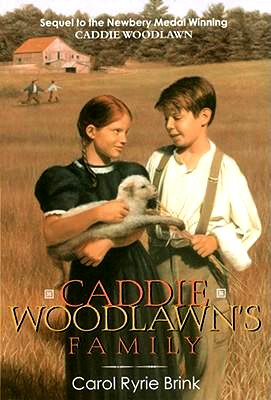 Nearly ten years have gone by since the first Caddie Woodlawn book appeared, and the girls and boys who were Caddie’s first readers have now grown far beyond her. But letters continue to come from new readers. Perhaps for the sake of the very newest readers, who may not yet have read the first book and who are meeting Caddie here for the first time, it would be well to introduce the Woodlawn family once again. In 1857 Caddie’s father brought his family from Boston to western Wisconsin, where he was to install a sawmill for the Carson and Rand Company on the Eau Galle River. At the time they came, three white families and a tribe of Indians comprised the little settlement. But after the mill was established many other settlers came, and the Woodlawns soon moved a few miles away to a farm near Dunnville on the Red Cedar River, where these stories take place. Father, with his rough red hair and beard and his kind good humor, understood the children and was greatly beloved by them. They were a little more in awe of dark-haired Mother, whose temper was sometimes hasty and who wanted them always to remember that they belonged to Boston as well as to wild Wisconsin. Clara, the eldest girl, was dark-haired, calm, and quiet, like her mother. Tom, Caddie, and Warren came next, and they were the redheaded and adventurous ones. Because Caddie had been delicate as a little girl, Father had let her live an outdoor life with the boys. Instead of learning to make samplers and cook, she had learned how to ride horseback and plow. She had grown as strong and rugged as her two brothers, and as full of bright ideas. Joe. The three youngest children had all been born in Wisconsin. We should not forget Nero, either, who was the Woodlawn’s dog and who shared most of the adventures of Caddie, Tom, and Warren. This book is perhaps not so much a collection of stories about Caddie as about the whole family; for you will find that one story is about Warren, two are about Hetty, and some are even about their neighbors. Yet all these stories grew out of memories of her childhood which Caddie shared with me when I was a small girl and she was my grandmother. Only one story in this book does not belong to Caddie. Once when I was at a Book Fair a gentleman came up to me and said, “My father was a circuit rider in Wisconsin. I wonder if he could have been the one your grandmother knew.” Then he told me a story which he said I might use if ever I cared to. It was a true story of something which had happened to his father. It was a good story, and I have been happy in this book to let Mr. Tanner, the circuit rider, tell it in very nearly the same way that it was told to me. These stories cover a period of three years, from the fall of 1863 to the fall of 1866. The first book of Caddie Woodlawn covered one year, 1864–65. In the story called “Magical Melons,” Tom would be about twelve, Caddie ten, and Warren eight. As the stories go along, the children will be growing older. and mysterious on a rainy autumn day. The horses munched and stomped in their stalls, glad of a period of rest from fall plowing and hauling. The cows switched their tails and blew softly through their nostrils. Tom, Caddie, and Warren Woodlawn had perched on the side of the box stall watching Robert Ireton and Tom Hill, the hired men, at their milking, and they had all helped with the feeding and cleaning of the stalls. Now that the chores were done, the two hired men made a dash for the kitchen to pass the time of day with Katie Conroy, the cook. “Mind ye get yourselves into no mischief now,” were Robert’s parting words. “No, I mean I feel like acting bad,” said Warren cheerfully. “In the haymow!” said Caddie. “I wish we could find buried treasure or fight Indians or something exciting,” said Warren. look at his tongue, Tom,” said Caddie. In a moment Warren found himself pinned down and reluctantly displaying his tongue. said Warren resentfully, trying to free himself. Warren arose with wounded dignity and brushed himself off. They climbed the ladder into the vast, sweet-smelling loft. Here the rain drummed loudly on the roof and seemed to shut them completely away from the world outside. Up in the rafters, pigeons rustled and cooed. The summer’s hay, piled high, made an excellent place in which to hide. They drew straws to see who should first be “It,” and Warren drew the unlucky straw. He put his head on his arm and leaned against the side of the barn with his eyes tightly shut. There was silence in the haymow. Warren uncovered his eyes and looked around him.